This healthy, festive salad—gussied up here with dried cranberries and garbanzo beans—is packed with antioxidants, beneficial ingredients, and flavor. I once saw a magazine ad where a woman was saying something like, "Is it weird to have a daydream about salad dressing?" which at the time I did think was a little weird. 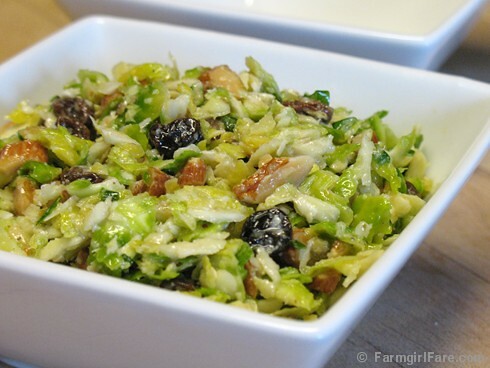 But then one night I found myself telling my hunky farmguy Joe that I couldn't wait to go to sleep so I could wake up and have leftover brussels sprouts salad for breakfast. Not being a brussels sprouts fan himself, this announcement was met with a worried look and probably an eye roll (it was dark), which was fine, because I wasn't planning on sharing my leftover salad with him anyway. I love this salad even more than I love my Quick Roasted Brussels Sprouts with Lemon and Parmesan, and you know I love them a lot. I created it back in 2009 and have been devouring it for breakfast, lunch, dinner, and snacks ever since. My recipe notes from 4/15/09 say I mixed up that batch at midnight. You've been warned. Raw brussels sprouts have a wonderful taste; it's as if the flavor from an entire regular size cabbage has been concentrated down into each little sprout. And of course they're extremely good for you. It's always nice to be crazy about something that's heavenly and healthy. The brussels sprouts for this salad are quickly shredded in the food processor—thus rendering them unidentifiable by confirmed brussels sprouts haters—and the tangy dressing, which is whizzed up in the blender, can be made several days ahead. I usually make a double batch of dressing to keep on hand for tossing together last minute salads. Try it drizzled over arugula and cherry tomatoes or tossed with thinly sliced raw kale. This would be a festive, last minute addition to your holiday table, but if one of your goals for the new year is to up your intake of cruciferous vegetables, it would also be a delicious way to usher in the new year. Raw brussels sprouts at midnight, anyone? The basic version of this salad is wonderful, but I usually gussy it up with a healthy boost of either raisins and roasted almonds or dried cranberries and garbanzo beans (chickpeas). When I served it to my foodie mom during one of her farm visits, she requested hers with almonds and dried cranberries. Make it however you like. The dressing tastes even better when made ahead of time, and the salad benefits from being tossed together a few hours in advance. The next day it still tastes great but it isn't quite as pretty. A squeeze of lemon just before serving adds a perfect zip, or offer lemon wedges on the side. As always, I urge you to seek out local and organic ingredients; they really do make a difference. Fresh chives are a luxurious, easy to grow treat, but finely chopped scallions are a fine substitute. Place all the ingredients in the jar of a counter top blender (I love my big KitchenAid blender) and blend until thoroughly combined. This dressing tastes even better when made ahead of time and will keep in the refrigerator for several days. If not using immediately, whisk with a fork before pouring over the salad. Shred the brussels sprouts in a food processor using the slicing blade (not the one with the holes). Or you can thinly slice them with a sharp knife or mandoline slicer. 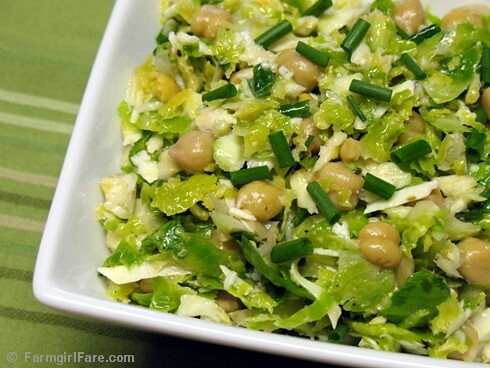 In a large bowl, toss together the brussels sprouts, Pecorino Romano, and chives. Add about 3/4 cup of the dressing and mix well. Salt and pepper to taste, adding a little more dressing and/or any of the optional additions listed below if desired. Garnish with chopped fresh chives and a squirt of lemon juice. I like to combine raisins and almonds or dried cranberries and garbanzos. My foodie mom prefers almonds with dried cranberries. To make two different variations from one batch, divide the salad in two and add half the amounts listed above: for example, mix 1/3 cup raisins and 1/3 cup almonds with a half batch of salad. Can't survive on simply salad? You'll find links to all my sweet and savory Less Fuss, More Flavor recipes in the Farmgirl Fare Recipe Index. © FarmgirlFare.com, where Farmgirl Susan shares recipes, stories, and photos from her crazy country life on 240 remote Missouri acres—and some of us can be pretty selfish with our sprouts. If only I'd read this yesterday before going to the grocery store! This will definitely make its way onto the New Year's menu! Yum! That looks divine. I will definitely be trying that soon. This is definitely on my list of things to try. I made this for Christmas Dinner and it was a hit. I packed away the leftovers and this morning they were all gone. This recipe is a keeper! Gorgeous salad! I can't wait to try it. Looks like it would be a filling salad good for bringing to work for lunch. Have had this recipe in mind for a long time now... was about to roast up my brussel sprouts for lunch (my usual garlicky treat) but went this route instead- delicious! Thanks! This salad is SO good, Susan. I'm sorry I waited so long to try it. I actually preferred it the 2nd day as the shreds of Brussels sprouts had softened somewhat - made it slightly easier to chew. I added dried cranberries. Anyway, LOVED it, so thank you once again for a great recipe. Awesome salad (and great blog), thanks! I'm looking forward to new variations. I loved your tip of using a food processor, it was a big time saver and I never would have been able to slice the sprouts thin enough. One thing you might want to clarify for amateur cooks is that the 'dressing' should be tossed on the salad a few hours in advance and allowed to sit. I know you mention it but for skimmers like me, it's easy to miss. Feel free to delete this portion of my comment, really not trying to be critical! :-) Thanks again. Just made the dressing. Awesomely good! The idea was to make the whole salad, but the sad truth is that I love roasted brussel sprouts, so I thought I'd roast them and then put them into the salad, but I wound up eating them all. Dang! Back to the grocery store tomorrow!!! Anyway, the dressing is a keeper. I'm sure the whole thing will be, too, if I can just keep away from the brussel sprouts. I need a Line of Control in my kitchen, apparently!